The good news – This Saturday, Feb 16, 8 PM the brand new American Roots Concert Series will kick off with a bang in Auburndale. 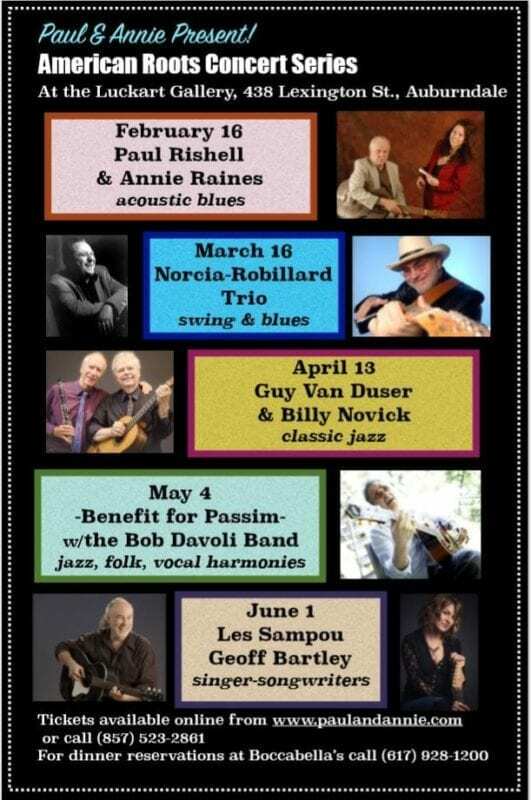 The much acclaimed and award winning blues duo of Paul Rishell and Annie Raines will be performing at the Luckart Gallery next door to Boccabella. This is the first of five American Roots concerts scheduled there over the coming months. Here’s the whole program. Boccabella will have full bar service and lighter fare available at the concert. Better yet, book a reservation for dinner at Boccabelle before the show. We love that place around my house. The bad news – I’ll be out of town and miss this fabulous show … but you shouldn’t. Get your tickets here. Paul and Annie are terrific musicians and storytellers, and the gallery setting is an intimate place to experience a performance. This Saturday’s show is almost sold out, so get your tickets now if you don’t want to be shut out! Steve, I just got two tickets. See you there.